Your dog will build on important, real-life obedience skills and manners. You should have graduated from the M.A. level C.L.A.S.S. or your dog should have the skills taught in that class. Does Your Dog Really Know Sit? If he can sit under many challenging and distraction situations he is much more manageable. Hand Target. A dog who has learned to target a person’s hand is less likely to jump up on them or shy away from the hand. In week 6 a mock evaluation may be done so you will understand what you need to work on for complete success at this level. Click here to check out what skills are tested in the Ph.D. evaluation. The My Dog Has C.L.A.S.S.- Ph.D. (Doctorate Level 3 for your dog)- Canine Life and Social Skills- is the way to achieve or improve important skills. 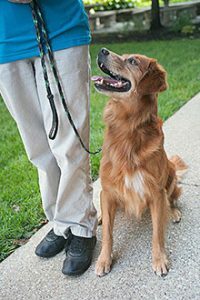 Using the skills learned in this class in everyday situations, a dog can become a well-behaved member of your household and a welcome part of society. As humans we have the tendency to notice and react when our dog is dong something we don’t like. In this class we will show you how to improve your relationship by rewarding your dog for doing things you do like. When the communication is two-way, the mutual trust is strong. We will use instructive training, telling our dog, wihout anger or force, what we would like him or her to do. Clear boundaries and rules will be set for our canine companions so they feel more secure knowing what’s expected, and flourish in the learning environment. Click here for a video showing all about C.L.A.S.S. and the evaluation for each level.